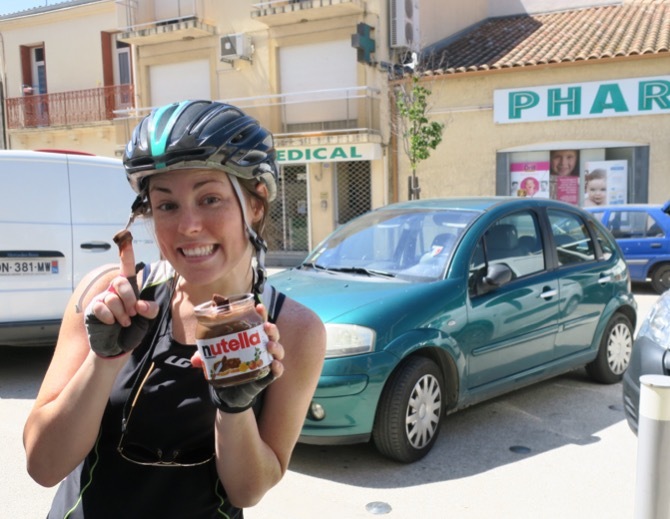 Refreshed from our day off we said goodbye to our hilltop hostel in Sète and our fellow touring cyclist Alex. 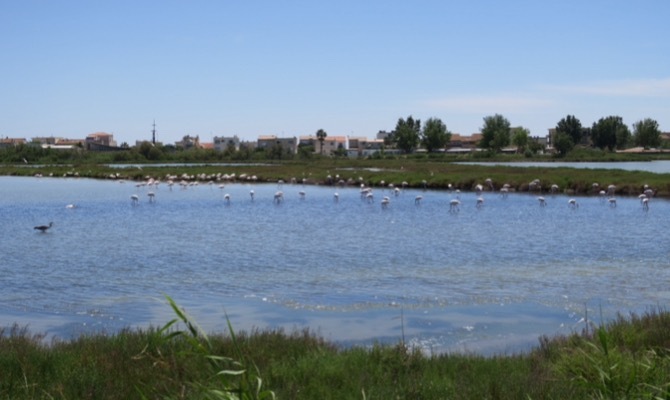 Today we would be cycling into and staying in a special part of France called the Camargue: a natural region of France nestled between the two arms of the Rhône River delta and the Mediterranean. 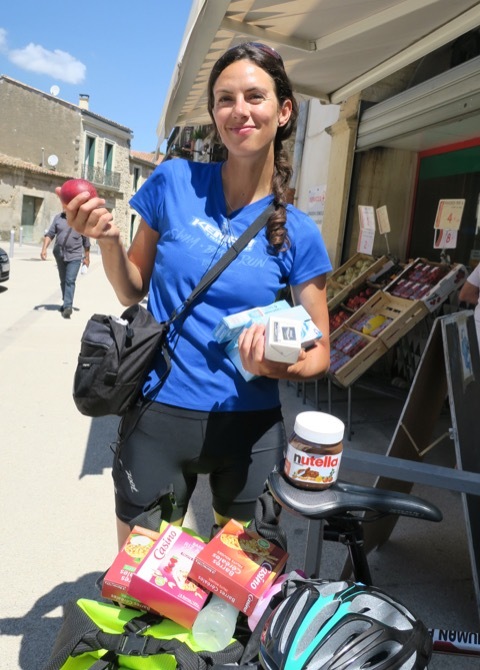 We stopped at a small grocery store midday to stock up on cereal bars for the road, as well as such essentials as laundry soap, fresh fruit, cheese and a large jar of Nutella. We have a Nutella addiction. Please send help. One of the intriguing things about this form of travel is you never know what the road before you is going to turn into. Quite the analogy for life really. One moment it’s a quiet country road with a wide shoulder, next you’re on a narrow and hectic highway dodging semi trucks. 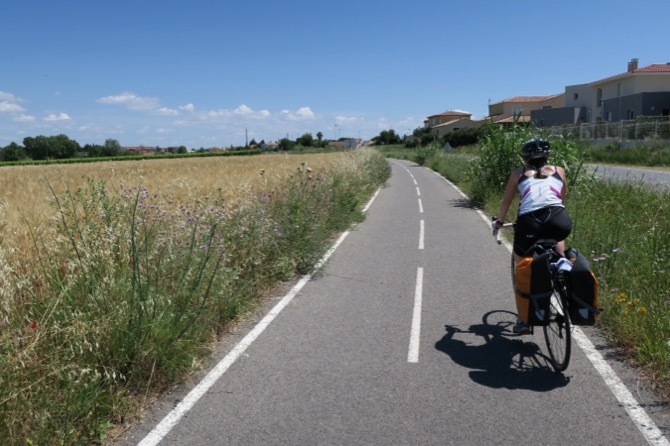 Today we were pleased to find a pristine double lane bike path to carry us into the Camargue. Three cheers for new, roomy, and direct bike paths! 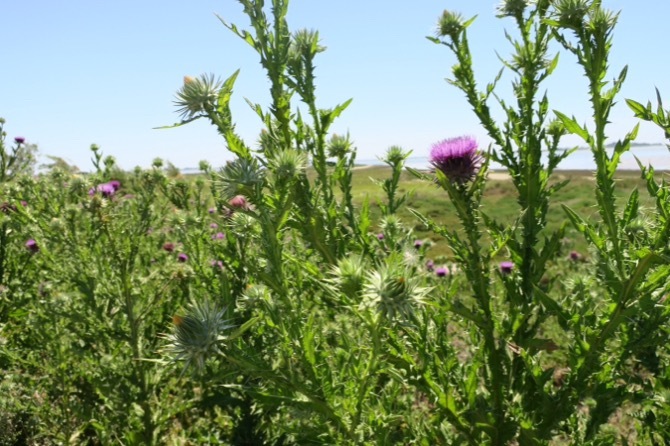 as we neared the Camargue we felt the environment start to change. The mediterranean edges became more brackish and marshy. The folliage became dense and competitive. 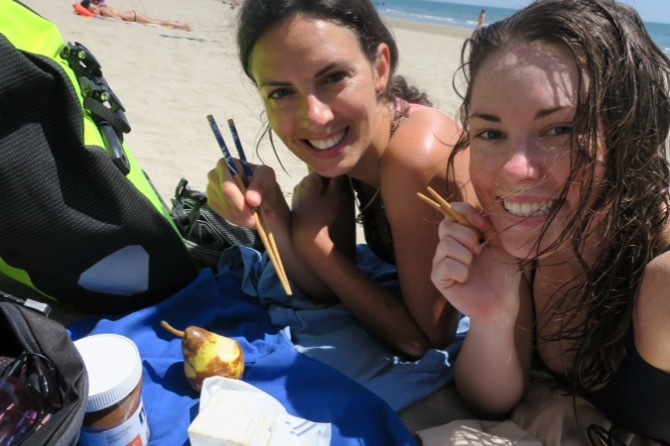 The last stretch of beach before we were fully in the Camargue had us craving a dip, so we swam, sun bathed and munched on all the tasty things we picked up at th grocery store earlier. The chopsticks worked for everything except the whole fruit. Chopsticks are the ultimate light weight travel utensil. 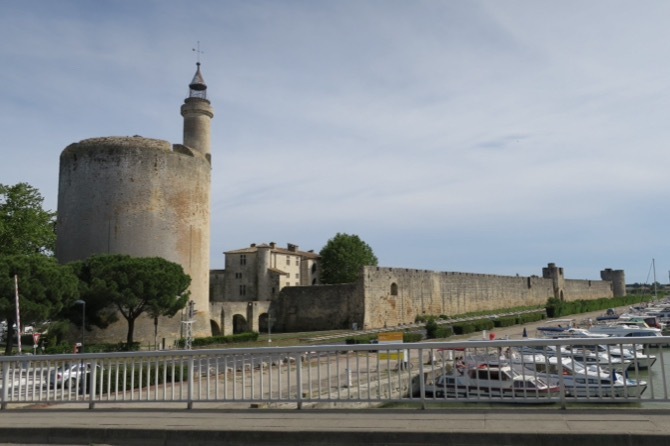 We stopped for a quick lunch in the city of Aigues-Mortes. When I glanced at the cluster of restaurants on the map I didn’t realize they were within the perimeter of the stronghold. So castle we did over a crêpe and sandwiches. 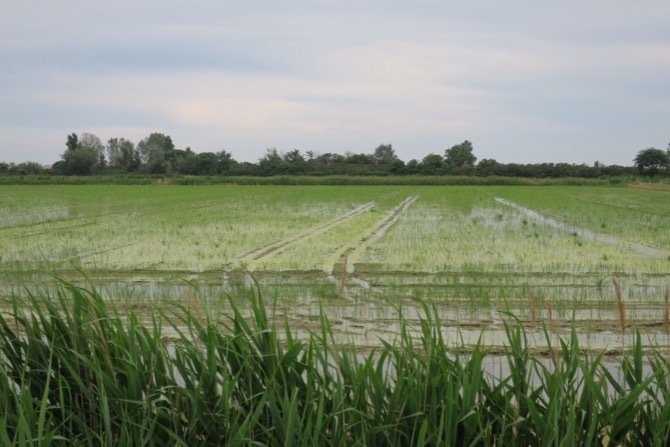 As we traveled deeper into the Camargue I was surprised to see what appeared to be rice paddies (did we just enter a wormhole to Southeast Asia?) 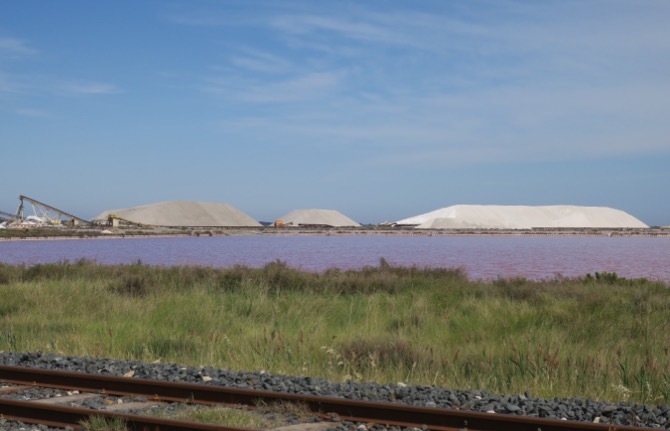 which signs confirmed as producers of the famous red Camargue rice. 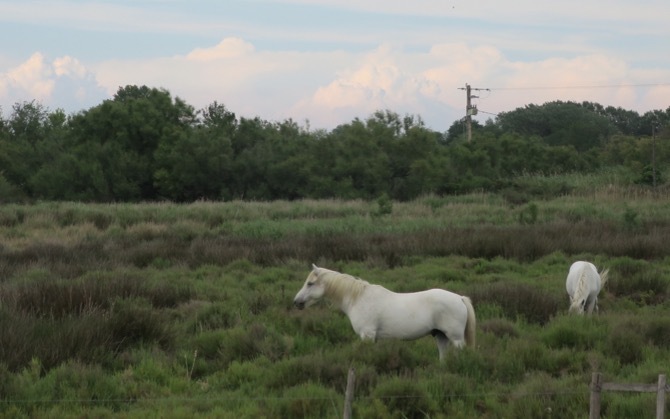 We cycled on admiring the rugged and marshy grasslands dotted with the famous white Camargue horses and their dark foals. At this point you could have told me I was in Ireland and I would have believed you. About 7 miles from the quaint chateau where we would be staying at for the night Bita began to experience excruciating right knee pain. We slowed our pace and she fought through the last miles but could hardly walk when we finally arrived and got off our bikes. We both hoped a solid night’s rest would help her knee recover. Thanks Sunny! 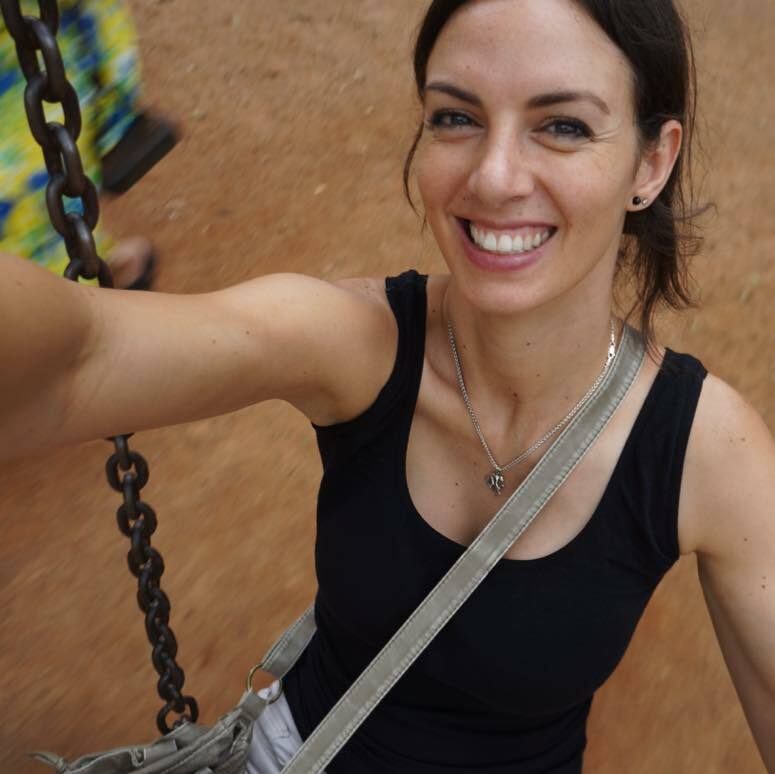 She’s doing better now and that’s exactly what we suspect it is. Took a rest day and bought an ice pack and ibuprofen as well as a supportive strap for her knee. We’ll carry on and hope to see improvement!